We also offer Bed & Breakfast with all our accomodation. 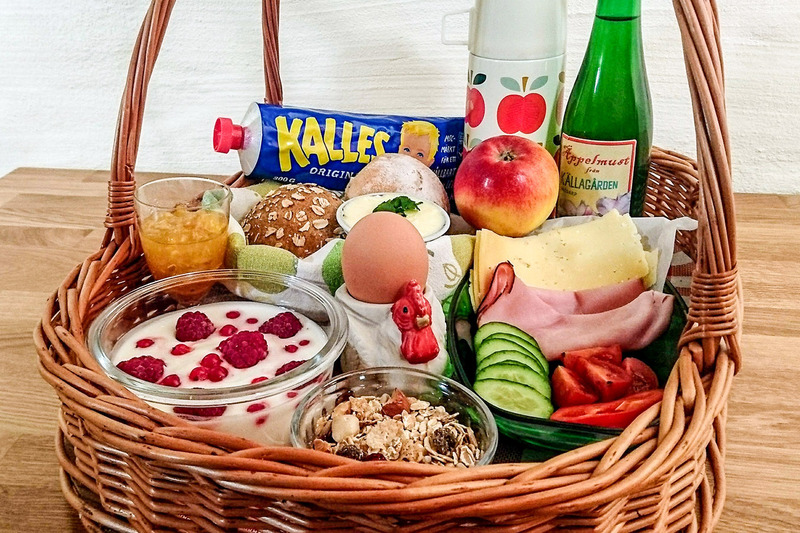 You get the breakfast in a basket in the morning at the agreed time and if you choose complete B&B you will also arrive to made beds and don’t have to bother about the cleaning.. We try to adapt the breakfast basket as much as possible to your individual preferences, based on what we have to offer. The breakfast basket usually contains yogurt, muesli, boiled eggs, freshly baked buns, toppings, vegetables, fruits and berries in season from our garden, our farm apple juice and a hot beverage like freshly brewed coffee, tea or chocolate milk. If you choose complete Bed and Breakfast, the beds are made when you arrive, you don’t have to bring towels and we take care of the cleaning, and the breakfast basket is included. Note!The price of the B&B will be added to your accommodation. The kitchen is off course still fully equipped for self-catering also when you chose our Bed & Breakfast. We try to adapt the breakfast basket as much as possible to your individual preferences, based on what we have to offer.